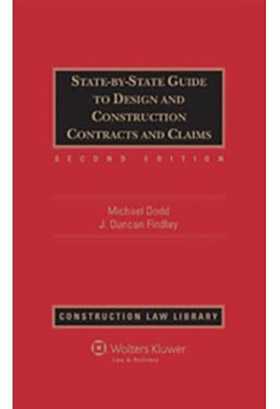 State-by-State Guide to Design and Construction Contracts and Claims provides a practical, state-by-state analysis of legal issues affecting architects, engineers, project owners, and construction contractors. Included are in-depth treatments of design and construction issues for all 50 states, Washington, D.C., and Puerto Rico. Updated annually, this essential sourcebook covers each state in its own separate chapter written by leading construction industry attorneys from that jurisdiction, making it easy to find answers quickly for your jurisdictions. Are contract clauses that waive a potential claimant's statutory lien rights enforceable in your jurisdiction? Can you enforce "pay-if-paid" and "pay-when-paid" contract clauses in your jurisdiction? Is there a leading case or statute in your jurisdiction that specifically discusses the elements of a claim for breach of contract? Is there a leading case or statute in your jurisdiction that specifically addresses the elements of a claim for ordinary negligence, gross negligence, or professional negligence? What are the most common theories of recovery in the design and construction claim setting in a particular jurisdiction? What damages are recoverable in the context of design and construction claims in a particular jurisdiction? Designed to assist you in managing any type of litigation situation, the State-by-State Guide to Design and Construction Contracts and Claims offers expert explanations and analyses of the full range of contract and claim topics. Chapter 1. INTRODUCTION - Michael David Dodd, Esq., J. Duncan Findlay, Esq. Chapter 2. ALABAMA - Walter J. Sears III, Esq., James F. Archibald III, Esq., Amandeep S. Kahlon, Esq. Chapter 3. ALASKA - Terence J. Scanlan, Esq., Pamela S. Tonglao, Esq. Chapter 4. ARIZONA - James L. Csontos, Esq., Edward Rubacha, Esq. Chapter 5. ARKANSAS - Patrick D. Wilson, Esq., David L. Jones, Esq., Jeffrey H. Moore, Esq. Chapter 6. CALIFORNIA - Christine E. Drage, Esq., Anthony D. Platt, Esq. Chapter 7. COLORADO - Dennis J. Bartlett, Esq., Karl A. Berg, Jr., Esq. Chapter 8. CONNECTICUT - Gary F. Sheldon, Esq. Chapter 9. DELAWARE - Daniel F. Wolcott, Jr., Esq. Chapter 10. DISTRICT OF COLUMBIA - Adrian L. Bastianelli III, Esq., Lori Ann Lange, Esq., Nick R. Hoogstraten, Esq. Chapter 11. FLORIDA - Amanda B. Buffinton, Esq., Meredith A. Freeman, Esq. Chapter 12. GEORGIA - R. Lee Mann, III, Esq., Daniel M. Murdock, Esq. Chapter 13. HAWAII - Kale Feldman, Esq., Keith Y. Yamada, Esq., Marion L. Reyes-Burke, Esq. Chapter 14. IDAHO - Robert A. Anderson, Esq., Yvonne A. Dunbar, Esq. Chapter 15. ILLINOIS - Matthew D. Jacobson, Esq., William C. Scales, Jr., Esq. Chapter 16. INDIANA - Terrence L. Brookie, Esq., Dean R. Brackenridge, Esq., Daniel P. King, Esq. Chapter 17. IOWA - Jeffrey D. Stone, Esq., Eric S. Fisk, Esq., T. Ryan Lamb, Esq. Chapter 18. KANSAS - Jerome V. Bales, Esq., Kenton E. Snow, Esq. Chapter 19. KENTUCKY - David R. Monohan, Esq., Philip M. Longmeyer, Esq. Chapter 20. LOUISIANA - Terrence L. Brennan, Esq., Keith J. Bergeron, Esq., Kelly E. Theard, Esq. Chapter 21. MAINE - Rebecca H. Farnum, Esq., Jason P. Donovan, Esq. Chapter 22. MARYLAND - Randal W. Wax, Esq., David J. Butzer, Esq. Chapter 23. MASSACHUSETTS - Jeffrey L. Alitz, Esq., Elitza V. Miteva, Esq. Chapter 24. MICHIGAN - David M. Hayes, Esq., Jay M. Berger, Esq., Jeffrey M. Gallant, Esq. Chapter 26. MISSISSIPPI - David W. Mockbee, Esq., Alexander F. Guidry, Esq. Chapter 27. MISSOURI - John S. Sandberg, Esq. Chapter 29. NEBRASKA - Craig C. Dirrim, Esq., Edward H. Tricker, Esq., Erin L. Ebeler, Esq. Chapter 30. NEVADA - Christine E. Drage, Esq., Anthony D. Platt, Esq. Chapter 31. NEW HAMPSHIRE - Jeffrey L. Alitz, Esq., Colleen A. Wolcott, Esq. Chapter 32. NEW JERSEY - Lee M. Tesser, Esq. Chapter 33. NEW MEXICO - Sean R. Calvert, Esq., Eric K. Gilbert, Esq. Chapter 34. NEW YORK - Michael J. Bynne, Esq. Chapter 35. NORTH CAROLINA - Eric H. Biesecker, Esq., R. Harper Heckman, Esq., David A. Senter, Esq. Chapter 36. NORTH DAKOTA - Mark J. Heley, Esq., Stephen F. Buterin, Esq., Brian W. Varland, Esq. Chapter 37.OHIO - Michael W. Currie, Esq., O. Judson Scheaf III, Esq. Chapter 39. OREGON - Richard E.Alexander, Esq., Sean C. Gay, Esq., Stephen P. Kelly, Esq. Chapter 40. PENNSYLVANIA - Gunther O. Carrle, Esq., Bruce D. Lombardo, Esq. Chapter 41. PUERTO RICO - Alfredo Fernández-Martínez, Esq. Chapter 42. RHODE ISLAND - Jeffrey S. Brenner, Esq. Chapter 44. SOUTH DAKOTA - Michael W. Currie, Esq., O. Judson Scheaf, III, Esq. Chapter 45. TENNESSEE - Gregory L. Cashion, Esq., Vic L. McConnell, Esq., H. Brent Patrick, Esq. Chapter 46. TEXAS - Jeffrey R. Parsons, Esq., John K. Broussard, Esq. Chapter 47. UTAH - Robert F. Babcock, Esq., Cody W. Wilson, Esq. Chapter 48. VERMONT - Mark G. Hall, Esq. Chapter 49. VIRGINIA - Daniel E. Toomey, Esq., Tamara M. McNulty, Esq. Chapter 50. WASHINGTON - Dennis M. Strasser, Esq., Stanton Phillip Beck, Esq. Chapter 51. WEST VIRGINIA - Johnson W. Gabhart, Esq., Sarah A. Stewart, Esq. Chapter 52. WISCONSIN - Hugh N. Anderson, Esq., Saul C. Glazer, Esq. Chapter 53. WYOMING - Michael W. Currie, Esq., O. Judson Scheaf, III, Esq.